Impedance from Voltage and Current: The main idea with measuring the impedance of the electrode-to-skin interface is for the EEG system to inject a known current through the electrode and to measure the resulting voltage difference. Since V = I*R, you can easily compute impedance "R" by taking the measured voltage "V" and dividing by the known current "I". Pretty easy, right? Well, how do you inject the current? And how do you measure the voltage across the electrode-to-skin interface? Injecting the Known Current: The core of the OpenBCI board is the ADS1299 integrated circuit from Texas Instruments. It has a feature called "Lead Off Detection" that does this trick of injecting a known current into each electrode. As you can see in the figure above, a very small current (shown as 6 nA) is forced into the electrode line by a current source built into the ADS1299. So, no matter how much resistance or impedance is between the current source and ground (within reason, of course), the system forces 6 nA through the electrode to ground. What is Ground? Unless you are sitting in salt water or touching something big and metal, it is unlikely that your body is connected to ground. To address this, an EEG system often provides an extra connection in addition to the regular electrodes. This extra connection is usually called something like "bias", or "driven ground", or "driven right leg (DRL)". The purpose of this connection is to keep your body's DC voltage level within an acceptable range and to keep any common-mode AC signals in your body minimized. Therefore, the bias line will act to source or sink whatever current as necessary (within reason) to minimize your DC and common-mode AC signals. As a result, for the 6nA current that we are injecting, "ground" is the bias driver, as shown in the figure above. Measuring Just the Electrode-to-Skin Voltage: If the bias driver is our ground, the figure shows one way to model where the current goes. Note that the current passes through several unknown impedances on its way to ground. 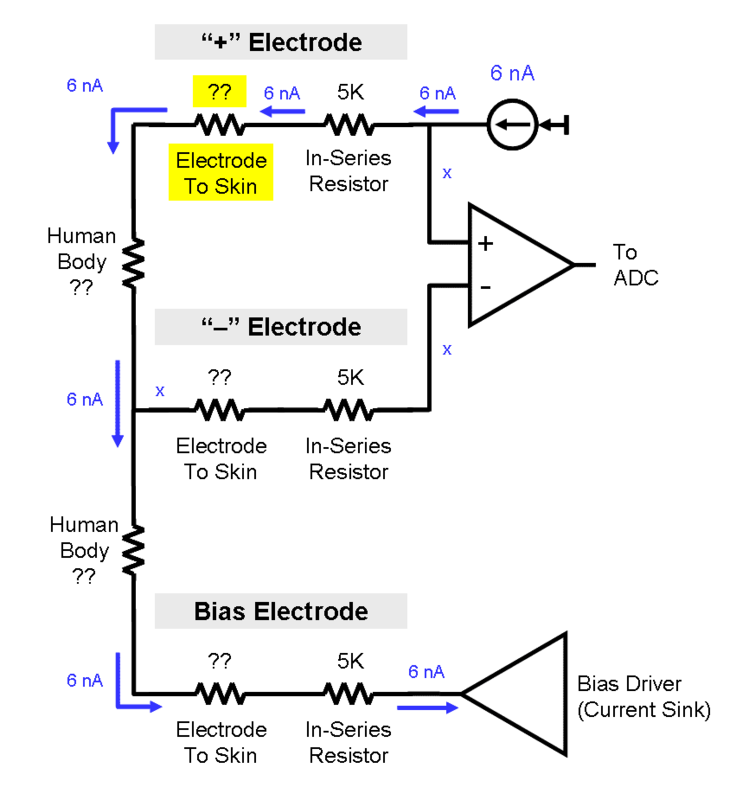 How do we evaluate just the impedance of the "+" electrode's interface to the skin? The answer is to remember that an EEG system measures the voltage between its "+" input and its reference (or "-") input. Because of the high-input impedance of the differential amplifier, no current flows into the "-" electrode line, so none of its impedance elements matter (for the purpose of this measurement). Therefore, we can easily measure just the voltage drop across the first three elements -- the 5K in-series resistor, the electrode-to-skin impedance, and the impedance of a portion of the human body. Because the series resistor is known, and because the impedance of the body is too small to matter, we have only one unknown remaining -- the impedance of the electrode-to-skin interface. Finally, remember that the "R" here is the the series resistance of the electrode-to-skin interface plus the 5K resistor built into the OpenBCI board. So, to get the impedance of just the electrode-to-skin interface, you need to subtract 5K. Testing on OpenBCI: To confirm that this all works in real life and not just on paper (or, um, just on a blog page), I used one of my OpenBCI boards to test it out and confirm that it works. The simplest test that I could devise was to use clip leads (see picture below) to jump together the electrode connectors. Specifically, I connected four of the "+" electrode connectors to the single reference (ie,"-") electrode connector, which is then jumped to the bias electrode connector. This configuration eliminates all of the electrode-to-skin impedances and the human body impedances. The only impedances remaining are the 5K series resistors. Hopefully, when I do my voltage measurements and divide by the 6 nA current, I'll get a number close to 5K. Testing the Impedance Measurements on an OpenBCI V1 Board. to the reference electrode and to the bias electrode. Configuring for the Test: Because I only had a few clip leads, I could only jumper four of the eight "+" electrode connectors. As a result, when I ran OpenBCI, I only activated channels 1-4. I configured the "Lead-Off Detection" settings to generate a 6 nA current source at a frequency of 31.2 Hz. 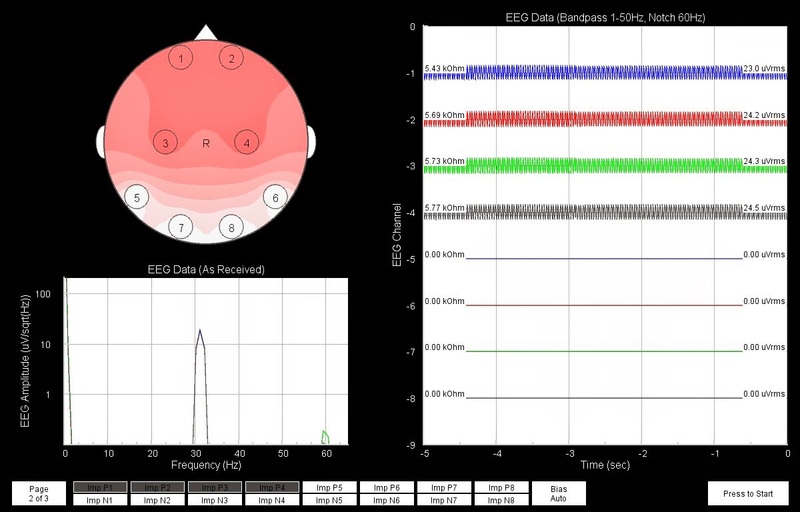 I then started to activate the current sources on the "P" side of each EEG channel. I saw that I could activate and deactivate the signal on any given channel without affecting the signals seen on the other channels. Excellent. Screenshot of the OpenBCI GUI when running an impedance test on channels 1-4. Click to zoom. and that the resulting per-channel impedance is 5.4-5.8 kOhm. Results: With all four current sources active, I got the results seen in the screenshot above. As you can see (click to enlarge), a 31 Hz signal is present in the first four channels. You can see this in the time-domain montage on the right and in the frequency spectrum plot in the bottom-left. On the time-domain plot, you can see that my labels indicate that the voltage induced on each EEG channel is between 23.0 uVrms and 24.5 uVrms. Using my equation from a few paragraphs back, this yields impedance estimates of 5.43 to 5.77 kOhm. Since I'm expecting to see the resistance of each channel's 5 kOhm resistor, this corresponds to an error of 9-15%. Given that the ADS1299 datasheet says that the "known" current is only known to +/- 20%, I find my result to be very satisfying. I'm feeling pretty happy right now. Super-Advanced Topics: With the method described above, you can measure electrode-to-skin impedance of the electrodes attached to the "P" inputs of this system. The question remains on how to measure the impedance of the reference electrode (which is attached to the "N" inputs) and of the bias electrode. The short answer for the reference electrode is that you can use the similar ADS1299 feature for the "N" channel (as long as you do not use SRB1 as a cheater way to mux the REF to all of the "N" inputs, which is what we do in OpenBCI V1). And the short answer for the bias electrode is that the ADS1299 can detect if it is attached, but it cannot measure its impedance. Luckily, the impedance of the bias electrode is not as relevant. Overall Success: So, I'm feeling pretty good about getting this impedance measuring to work. The code for implementing this has been pushed to the OpenBCI GitHub. The next step is do do some impedance measurements using actual electrodes on my actual head. Look for a follow-up post! Follow-Up: I linked this post to answer a question on the Texas Instruments user forums (regarding the Texas Instruments ADS1299 chip at the heart of OpenBCI). This post was recognized by TI for a TI Community Award, Aug 2015. Thanks, TI! -Do you disconnect the bias electrode and check the impedance? is it the same? - which gain do you use on PGAs with the current of 6nAmp? - Are you using simetrical sources for AVdd and AVss (+2.5V and -2.5V)? - Are you configuring the "bias_sense" registers for the 4 channels under test? I made the same test but only in channel 1, and when I disconnect the bias electrode there is no difference as when it is connected. 1) I did not test the impedance of the bias electrode. 4) I am not using the bias sense registers...for me, that would require yet more studying of the datasheet, so I decided not to employ that feature and start more simply. Regarding having no effect of disconnecting the bias lead, it would indeed have no effect on your measurements as long as the act of injecting 6 nA into your body did not raise your DC level ie, your common mode signal) to the point of saturating the inputs of the ADS1299. You are a capacitor, so you do have some capability to store the charge. You are also often capacitively coupled to the environment in some small way, so you will leak charge. Either way, I too have disconnected the bias lead and still finds that it works on my body. It does NOT work, however, in my synthetic test described above where I shorted the connections to each other. When there is no human body involved, I guess there is no ability to absorb the current (since none goes into the "-" electrode input) so it immediate ceases to work as soon as I disconnect the bias. I hope that this helps you figure out your problem! Good Luck! If you were to place your head, or shall I say lay your body down and submerge your entire head into a bowl of highly salinated water with these electrodes placed throughout; what would we see in theory? Since the electrodes are not immediately placed close to the skin, but are in proximity of the lining of the container that holds a volume of highly salinated liquid my guess is we would see a lot of noise or signal mixture right? The reason I bring this up is I recently spent some time in a sensory deprivation tank; which is a container filled a 1000 lbs of epsom salts; where you lay inside and float buoyantly. The water and air is heated to near your body temperature so you lose sensation between the air/water difference. With your eyes open or closed, completely black. You basically feel like a floating brain in this environment and I believe it would be quite interesting to start monitoring EGG/EMG in this state, especially once we turn on a LCD screen and can give some visual input. However; in this floating environment wearing a headset might be distracting in itself(you lay naked in the tank); could the tank be lined with electrodes? These are the kind of questions that come to mind in this place and I would love to participate in testing this further; until I get my hands on a board to test myself was curious if you had any guess. While I have not measured EEG (brain signals) while submerged, I have measured ECG (heart signals) while submerged. I've not done it in highly salinated water, only fresh (tap) water. But, it worked just fine. The key is to insulate the electrodes on your body (as well as the electronics, obviously) from the water. Otherwise, the electrodes will short to each other through the water and not pick up your body's signals. With ECG electrodes on your body, it's a obvious how one can insulate / coverup the electrodes to keep them from touching the water. With EEG electrodes, it's not nearly as obvious how to insulate them. But, if you can, I see no reason why it wouldn't work as well as ECG did. If you're going to try it yourself, I definitely recommend trying ECG first. You can debug your setup in a much easier way than going for those troublesome EEG signals. BTW, if you're sitting in a big salty tank, think very carefully about how you're attaching yourself to your computer. This could be a real safety hazard here. Run everything off batteries! Stay isolated! Don't kill yourself! I apologize in advanced for re-posting this question but I will shorten to hopefully make it less annoying. Is the amplitude of the frequency signal at 30Hz = 10 because of the 5KOhm impedance + the 5KOhm series resistor? That ~5 kOhm value would be the single 5K resistor that I have in series with the "+" channel. yes, I understand it better now, thank you a lot! I didn't zoomed into your "EEG Amplitude vs (uV/sqrt(Hz)) vs Frequency" plot. They stated that the FFT magnitude of the fundamental component will be directly proportional to the electrode impedance being measured, so looking at figure 45, at 31.25Hz, how does that amplitude relate to their 5K impedance? I was wrong to assume your plot was similar to this one! Thanks a lot for the useful insights! I can't help you with Figure 45. I tried a few guesses at what their vertical axis represents, but I can't seem to make it work out. I can help with Figure 44 and its text. In reading its text, it became clear to me that, unlike my bog post here, they choose to activate the INP *and* INM at the same time. The ADS1299 is wired (by default, at least) to push current out of INP and pull it in on INM, so the pseudo-circuit that I drew for my post doesn't really apply. Sorry that I couldn't help with their FFT plot. There are several ways to scale / normalize an FFT result, so it can be tough to back out what other folks did. Thank you Chip! that definitively helps, reading your blog post about not using SRB1 to mux the reference electrode with INMs (this is exactly what I'm doing) the alternative is to use SRB2, could you expand a little more on this subject? Thank you for all the great info, you are awesome. On the SRB1 vs SRB2 issue...well, that's complicated. All of my EEG recordings (and most EEG recordings in general) use multiple sense electrodes and a single reference electrode. For the ADS1299, the question is where to attach the reference electrode. For OpenBCI V1 (the green board), the sense electrodes plugged into INP and the reference was plugged into SRB1 (which gets routed in the ADS1299 to *all* of the INM). For OpenBCI V2, we flipped it around so that the sense electrodes went into INM and the reference electrode plugged into SRB2 (which gets routed in the ADS1299 to the INP channels *of your choice*). Both setups work fine, though because of the oddities of how SRB1 functions, you cannot check the impedance of your reference electrode if it is connected to SRB1. The SRB2 approach solves that problem, and it gives more flexibility on which channels get the reference, but it seemed weird that my sense electrodes plugged into INM instead of INP. This cannot be what TI intended me to do. Clearly, there had to be the "right" way that I was missing. After more contemplation, I think that the way that TI intended was for you to pick any INM that you like and declare that to be your reference electrode. Then, you'd use the software settings for SRB2 to route that one INM electrode signal out of the ADS1299 via the SRB2 pin. External to the ADS1299, you would jump SRB2 back into the SRB1 pin. Then, you'd use the software settings to connect SRB1 to be the reference for all of the channels' ADCs. As far as I can tell this setup achieves all the goals: (1) a common reference electrode, (2) very flexible routine of signals, (3) the ability to check the impedance on all electrodes, including the common reference. yes, that's great, I have much further reading to do on the SRB2 and SRB1 routing but is good to know that only using SRB2 I can obtain reference electrode impedance. Yes, you're right! When I activate the impedance monitoring on the ref channel, the waveform appears on all the channels on the GUI simultaneously. Thanks for the discussion about gels...I am familiar with some of the current options out there. When I'm using these individual cup-style electrodes, I feel that the gels won't be sufficiently sticky to hold the cups to my skin, so I stay with the thicker materials like the Ten20 paste. Having done a fair amount of work with ECG, in addition to EEG, I'm also familiar with skin preparation techniques such as scrubbing and abrading the skin. No fun! I think what really surprises me about my EEG impedance results is the variability in impedance for two sites that are so close together...such as the two locations on the back of my head. Or, in other results (not shown here), I can get ~10K on the sides of my head (C3/C4) but have difficulty getting < 60K on the back of my head. It's clear why the forehead might be different (no hair), but why is the back so different compared to the sides? Odd. And interesting. I just looked at your profile. I live most of the time in Florida but still maintain a house in St. Albans. We might be able to get together some time as I am in Vermont every other month. Very useful and interesting post! I'm trying to test, but I don't understand what registers have to be used from the user manual. Does it need to set only the register: LOFF to 01 - FLEAD_OFF[0:1] at 01 (enable ac leadoff)? Or do you have a different list of registers? Hi chip.This is a simplest way i seen to measure resistance.Thanks for your time. Do you have any idea to measure skin to electrode capacitance or total impedence. Measuring the capacitive component seems harder than measuring the resistive component. One way that you might be able to measure the capacitive component would be to measure the phase lag between the drive signal going into your body and the sensed signal coming out of your body. You can't do that with the setup shown above because you don't know the timing (ie, phase) of the drive signal. 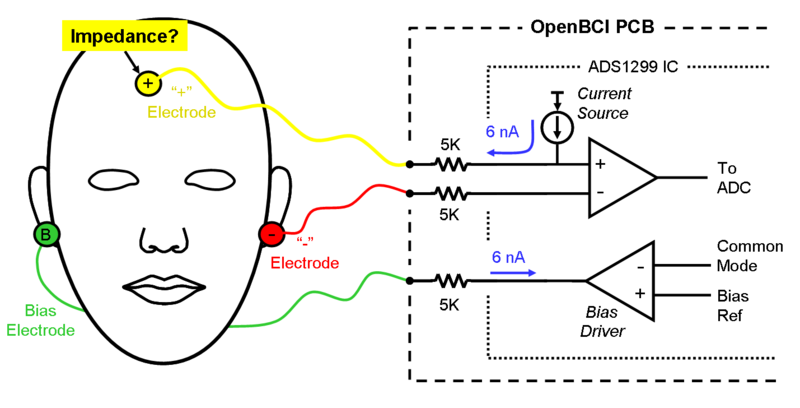 To get the drive signal, you could probably use a jump wire to send the OpenBCI drive signal back into one of the unused OpenBCI input channels (in addition to sending that same drive signal into your body). By recording the direct signal along with the signals from your body, you could compute their phase and estimate the capacitance necessary to induce that much phase shift. Note that I haven't ever done any of this...it's merely me thinking out loud about how I might try to do it. If you try it, let me know what you find! For the experiment shown here, none of the electrodes were connected to my body. I used jumper wires just to connect between the different pins of the OpenBCI board. For my follow-up test (at the link below), I put one electrode on my forehead, which was connected to CH1. I put the REF behind my left ear and I put the BIAS behind my right ear. Many other configurations are possible, too. excuse me , How do you judge Measuring signal correctly? I enjoyed reading all your posts, keep up the good work! I have a similar setup with a ADS1299, but not the openBCI. I tried verifying the impedance measurement with your method described here, but not successful yet. I’m using the SRB1 pin for the reference electrode, it has the same lowpass anti-aliasing filter as all positive electrode inputs. The reference electrode is routed to every negative input via the mux. Also, the bias output electrode has the same AA filter. On the schematic from openBCI v2.2 I saw an anti-aliasing lowpass-filter (5k + 4.7nF) at every input of the ADS1299. The 5k resistor you are talking about here is that resistor from the lowpass filter I assume. What about the influence of the capacitor? It is difficult to see in your signal waveforms, but I guess you also have some voltage spikes at every edge caused by the capacitor. Since these spikes affect the RMS value the calculated resistance is affected by them. Any thoughts on that? The method you described here makes sense to me, but does the assumption, that there’s no current flowing in the “-“ input, still hold if you consider the capacitor? Also (not really related to that), I am interested in how your bandpass filter is implemented. Is it a FIR or IIR? What about passband-ripple and roll-off characteristics? The 5K + 4.7nF is indeed for low pass anti-alias filtering. The resistor is in-series while the capacitor is to ground. It's a simple 1st order roll-off. As for the spikes, I don't know what you're talking about. A first-order low-pass filter will help suppress transient spikes, not generate them. Also, a first-order filter like this will never overshoot or "ring" like a higher order filter. As for the effect of the capacitor on the impedance measurement itself, it does induce some small amount of attenuation at the frequency used by the impedance-measuring test signal generated by the ADS1299. Given that the ADS1299 itself says that the impedance-measuring current is only accurate to +/-20%, and given that one is simply using the impedance checking to make sure that the skin impedance is "low" (a very non-specific term), I think that any effect of the cap is not relevant to the needs of this application. You're right about the spikes, my bad. One more question on the side here: are you able to use the continuous dc lead off detection simultaneously with the bias drive? Whenever I enable the bias drive it seems to saturate the dc lead off comparators. I have not tried to measure the impedance of the bias electrode, nor have I tried to use the "lead off detection" to see if it was attached. Sorry. Hey thanks for the awesome post! I tried the impedance measurement like you've done here, but I was constantly getting a very low value. For example with everything shorted and biased, the impedance read only 3k and not 5k from the series resistor. I went further and attached a potentiometer and after some tinkering I found that adding a "fudge factor" of 0.5 times my impedance measurement produced roughly an accurate figure (ex. 3k + 0.5 * 3k = 4.5k). Do you have any idea on what is causing this massive error in the measurement? I mean, a constant 50% error? Damn. Anyways thanks for the post! As stated in the post above, the current that is being injected by the ADS1299 is +/-20%. It is very reasonable that a "correct" reading of the in-line 5K resistor might be anywhere from 4K to 6K. If you are getting 3K, that is a bit low. I, too, have seen values that low, and I'm not sure why. It is possible that there is some capacitive coupling somewhere in the system that violates my purely-resistive model described above. Maybe that's the cause of the unusually low readings. Based on my experience with OpenBCI and with other EEG system, the process of measuring the electrode impedance seems to have a bit of an art (or voodoo) to it. I've never been completely satisfied. Even with these errors, though, the values are good enough to know when an electrode is attached well and when it is attached poorly. That's the main purpose of these impedance checks, so I've accepted that the performance is good enough. I am looking into methods for taking impedance measurements in particular. Quick question, are you using the ADS1299's onboard ADC and PGAs to record EEG signals following injection of the 6nA? I am considering using the similar ADS1194 (16-bit) since it is cheaper and I only require 4 channels. In forums, TI have suggested the use of pre-amplifiers before the ADS1194 due to a large amount of noise appearing at its input, since there is no filtering occurring in any way prior to the PGAs. The suggestion of pre-amplifiers however defeats the purpose of having impedance monitoring, since you cannot inject current into the output of instrumentation circuitry. Does this mean that I should consider using the ADS1xxx for injection of current (directly attached to the passive EEG electrodes), and completely separate instrumentation circuitry for recording data? This means I won't be making use of their PGA, ADC and SPI functionality, which seems like a big waste to me. For impedance measurement using the ADS1299, I only used its on-board features...it's built-in ADCs, PGAs, and current source. Sadly, I don't know anything about the ADS1194, so I can't help you there. Sorry! The EEG signals you are reading using the ADS1299 are precise enough to perform signal analysis, such as FFT I assume? I've found that the ADS1298 and ADS1299 are basically identical, except the ADS1299 is made for low-noise applications (EEG) - and are more expensive. Hi, Sean. We've tried to measure impedance of the pside by turning on the respective channel in the LOFF_SENSP register only. Then we've turned off pside in the LOFF_SENSP register and turned on nside by turning on respective channel in the LOFF_SENSN register. And we've got the same impedance values on both sides while it doesn't have to be so. May be we've done something wrong in setting registers. Can you give us detailed settings of the LEADOFF registers in order to measure impedance of the p_electrode only and for the n_electrode of the channel only. Thanks in advance. Chip, I'm attempting to replicate your efforts in impedance measurements using the ADS1299 Eval Board but not getting anything near valid results. Is it possible to test directly on a single channel? Or do you need to include the connection to the Bias Driver? Struggling here and thought I'd reach out and see if you had any hints/tips. I was wondering at which frequency you guys are measuring impedance in the openBCI. When we measure with the Autolab we get impedances of about 800kOhm at frequencies of 5-50Hz and with the same electrodes we get 40kOhm at openBCI. We are wondering about the frequency you guys use for your resistance values in the P and N settings of openBCI? 3. Please suggest, how many samples sufficient to analyze data? 4. At what sampling rate should we run ADS129X? 5. Which should be the ideal chip for application ADS1299 or ADS1298? I'm trying to figure out if the value shown in the newest release of the OpenBCI GUI is with or without the 5 kOhm resistor. I get an impedance of 18kOhm shown on the left when the voltage shown on the right is 76.4 uVRMS. ( 76.4u * sqrt(2) ) / 6n = 18 kOhm. So is the actual skin-electrode impedance 13 kOhm? I'm just surprised its not th elower value shown in the GUI. Also, when I short N1 to SRB, I get a resistance of 3.6 kOhm consistently. I tried putting in a 5.5 kOhm resistor then expecting to see 9.1, instead I got 7.48 kOhm.